Trenchless Sewer Relining Services ! Miracle Rooter is scpeilaized and certified sewer lateral lining installer in Los Angeles. 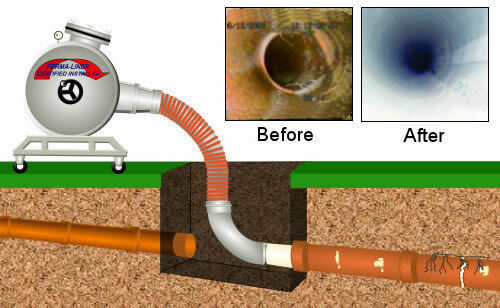 This is the preferred method of trenchless sewer line replacement as in most cases it requires no digging at all and is commonly referred to as “No Dig” sewer pipe repair. This method involves relining the entire length of sewer pipe with seamless, flexible PVC infused liner that is coated with epoxy resin. The new liner is unraveled and blown into the old sewer line using air usually from an existing access point called a clean-out. The epoxy coated side is simultaneously pushed against the interior wall of the existing sewer line. Once in place, a bladder is inserted the full length of the new liner and inflated with high pressure, heated air sealing it to the old sewer line. This effectively seals all leaks, cracks, and voids and leaves a smooth, rock hard seamless new pipe that’s water tight and highly resistant to future root intrusion, a leading cause of failed sewer lines. Los Angeles Sewer Relining requires one access hole and will rehabilitate the existing line by inverting an epoxy filled felt tube with a fiber glass scrim into the existing line and creating a new seamless PVC line. 6. Our experience makes a difference, quality workmanship guaranteed! Los Angeles, where many other plumbing companies they use this system but they are not certified by City of Los Angeles, we are also bonded sewer contractors for many city’s including Los Angeles, Burbank, Glendale, Pasadena, La County, Manhattan Beach, Inglewood, Thousand Oaks, Moorpark, Ventura, Oxnard, Anaheim, Monrovia and much more. If you are the customer and shopping around, please make sure that any company that you hire they are certified by City of Los Angeles. Eliminates street excavation, paving and concrete repair costs, and traffic control. If your sewer line cannot be renovated using our Maxliner system Miracle Rooter can still help you with a variety of other technologies. We will inspect your line and let you know if our relining process will work. If it will not work we will recommend another approach. The options include Pipe Bursting trenchless sewer replacement or open trench.